A kubbestol is a traditional Scandinavian chair made from a log. The kubbestol was quite common in some districts of Norway from about 1750 to 1960. 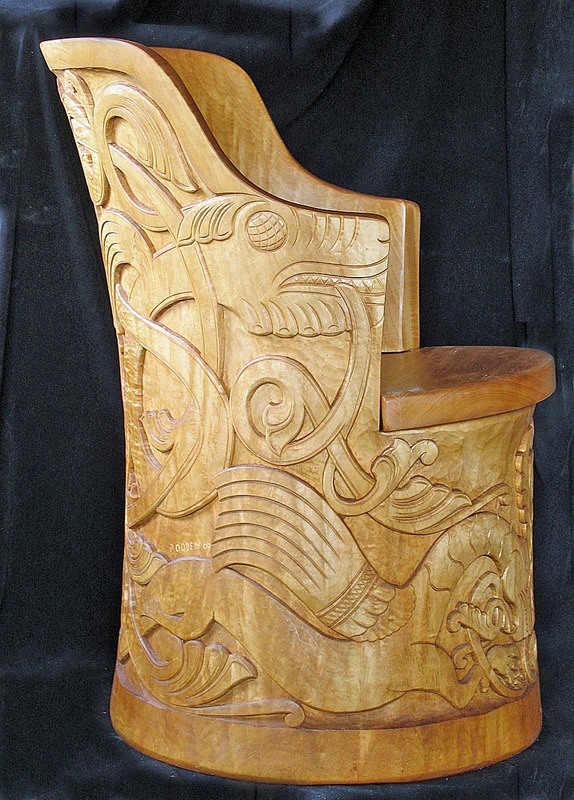 The chair form was also found in some homes in central Sweden, especially in the districts that border Norway. The kubbestol form can even be found in Denmark, but there it was more often made with wooden staves like a barrel. In Norway the kubbestol was usually made from logs with significant girth and three to four feet in length. 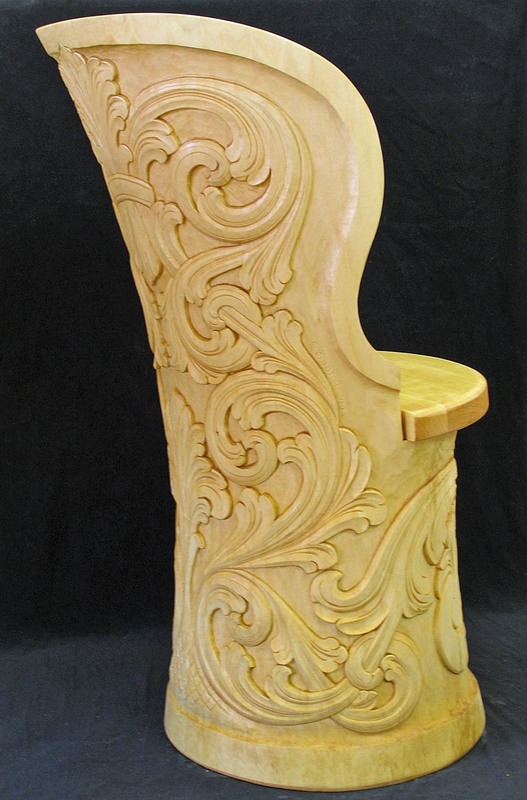 The log would be hollowed out so that the base (from the seat down) would be cylindrical while the back of the chair continued upward from the seat in a curved shield that made the chair both snug and comfortable. 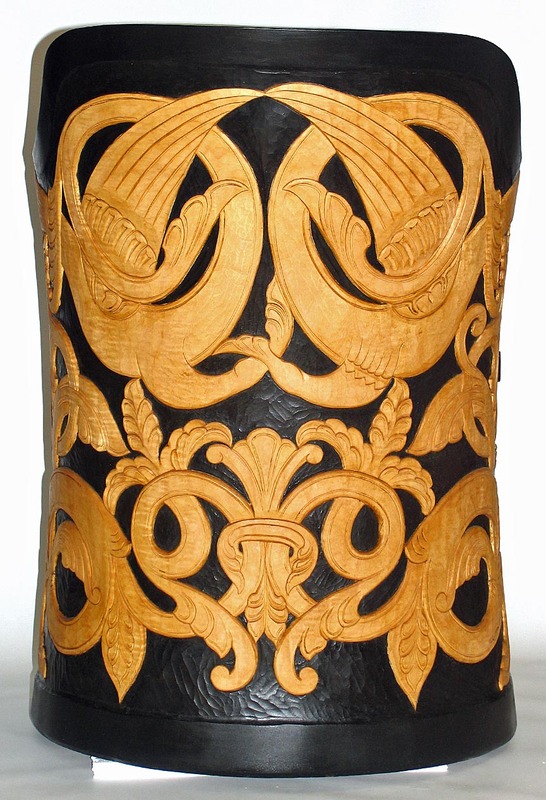 Most, but not all, kubbestols were decorated with carving, painting, or some combination of the two. Carved and painted decorations would differ from district to district and styles changed over time. 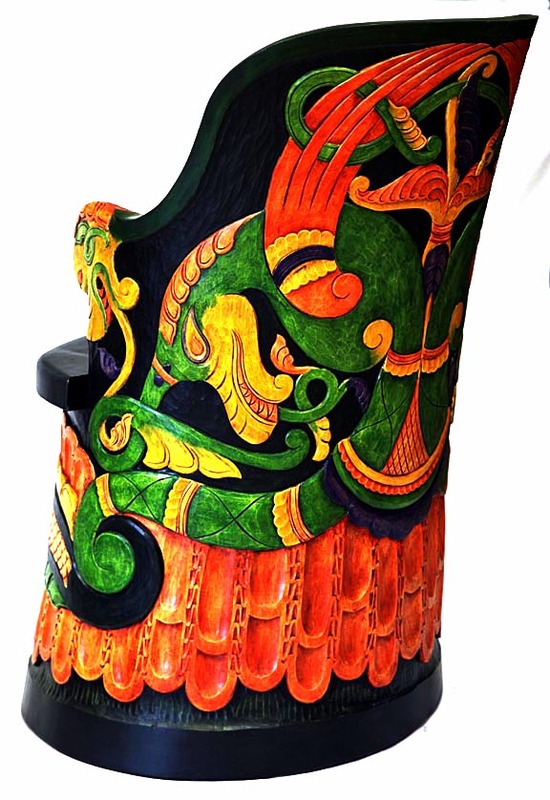 Some chairs received multiple coats of paint over the years, reflecting the different fashion periods. The kubbestol was often placed next to the open-hearth fireplace or next to the bed. It was reserved for the head of the household. Large, impressive farmhouses might have several richly carved and painted kubbestols as a display of wealth and status. At Norsk Wood Works the kubbestol logs are felled in the winter when the sap has settled down in the roots of the tree. The logs are rough shaped and the ends of the logs are sealed to slow the drying process, which keeps the logs from cracking. It takes about two years for the logs to air dry sufficiently to be ready to be shaped into the final chair form. 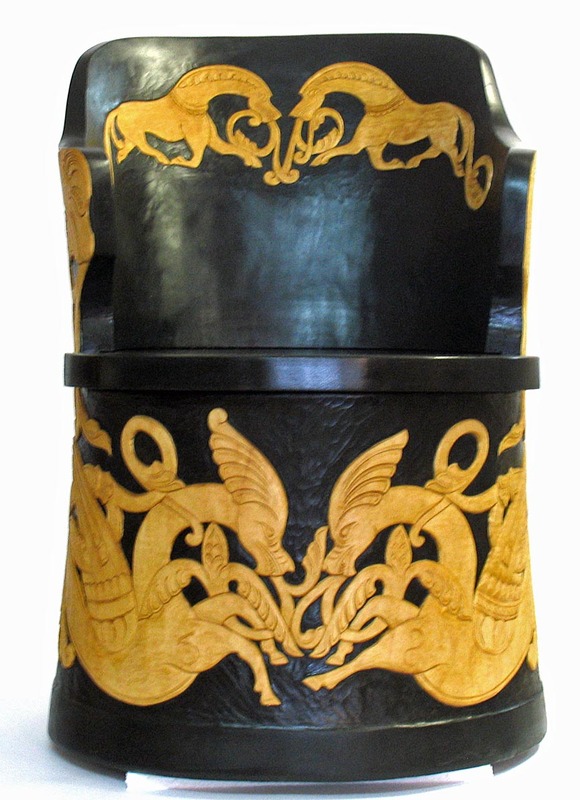 Once the chair is formed and has received a seat it is ready to be decorated. Often Phil or Else draw the soon to be carved decorations directly on the chair blank. 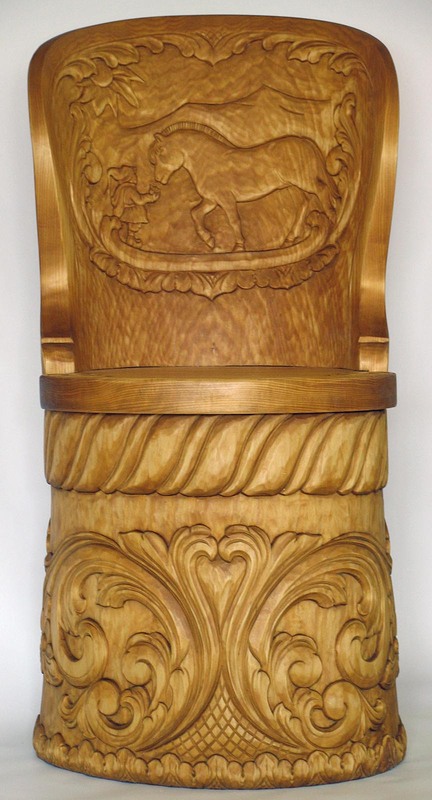 If the chair is custom ordered, they welcome input from the person ordering the chair regarding the carved or painted decorations. 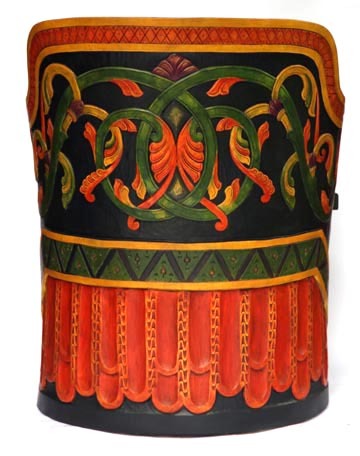 In 2015 the average price of a finished kubbestol ranged from $2800 to $3600 with some being less expensive and some more expensive, depending on the complexity of the decorations. These days the surprisingly comfortable log chair has become a symbol of Scandinavian roots for many American families with ties to Norway, Sweden, or Denmark. The kubbestol is a reminder of our rural heritage and a time when most things in and around the home were made by hand from materials found in nature. In this way the kubbestol becomes a family heirloom to be past down through the generations.